The previous two chapters were dedicated to the discussions of sovereignty discourses within Mainland China’s academic (Chapter 3) and political (Chapter 4) circles. 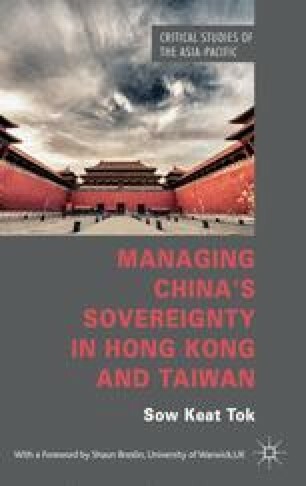 The most important finding in the chapters is the conceptual separation of sovereignty from right of governance, in the sense that from the viewpoint of the Chinese, sovereignty takes more of a de jure meaning and Beijing’s right of governance is not considered a necessary component of the sovereign whole. While this unique conception does not theoretically divide sovereignty per se, it again questions if the Chinese still see sovereignty as absolute, “Victorian,” or “inalienable.” Furthermore, in the last chapter, it was discovered that China’s sovereignty, at the discourse level, places Hong Kong and Macao on different levels. In contrast, Taiwan is given more leeway than Hong Kong in terms of the way Chinese sovereignty is upheld whether in spoken or imagined terms. From the words in public documents and leadership doctrines, how sovereignty actually manifests itself in Hong Kong and Taiwan appears the lesser issue compared to the maintenance of a unified de jure sovereign entity centred upon Beijing.